Hufcor® is excited to launch our new dynamic Revit® families for the 600 Series operable partitions. Our newly produced families were developed in conjunction with Eppstein Uhen Architects, Inc., Milwaukee, WI and beta tested by a team of architects prior to launch to ensure the families meet the ever-changing needs of the AEC community. The new Hufcor Revit families eliminate the major downsides found with current movable partition BIM objects available in the market today and enhance the way architects can quickly incorporate critical elements of an operable partition within a model. Dynamic, wall-to-wall object placement allowing designers to modify the size of the partition without having to download another family or get “broken” objects. Architects can embed links to Hufcor’s online specifications and MasterSpec® subscribers can set up links directly within each Revit family to a corresponding Hufcor 600 Series Product MasterSpec and SpecAgent® file to incorporate a formated specification consistent with your Revit model. For more details, please watch a video demonstration of how these new Hufcor 600 Series operable partition Revit families are truly the next generation of dynamic Revit content. If you’d like us to email you the new Hufcor “smarter” BIM Revit families click here. Hufcor distributors can assist you as well in designing your operable partitions and receiving the new BIM revit drawings. Certainly, the Hufcor 600 Series partitions are exported throughout the world for major projects requiring very tall panels. Yet, for architects outside the United States, the Hufcor 600 Series product and new Revit families may not be available or applicable for your specific project. To contact the local representative and to find the quality Hufcor products manufactured in your region, please click here. 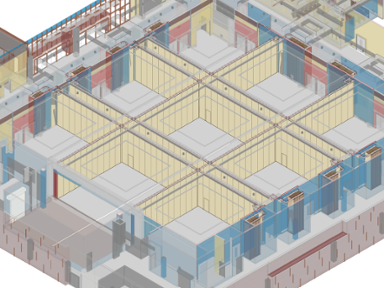 Building Information Modeling’s future depends of higher performing content that doesn’t take up massive file sizes. Hufcor’s development team spent painstaking time in programming the new Revit families to provide efficient file sizes. Architects that have had previews of the drawings have all raved about how small the files are to work with, even when dealing with large, complicated case studies like the one shown below. With the new BIM Revit families, the Hufcor, Inc. design team can assist architects developing complicated layouts with many of the traditional accessories items required on a project – pass doors, panic hardware, marker boards, field-applied face finishes, etc. With all of the built-in functionality, we hope you too share Hufcor’s excitement with our new BIM Revit families for the 600 Series operable partitions. FOLDING PARTITIONS. FAST AND EASY ROOM DIVIDERS. During my two decades plus of marketing and selling space division products, architects and owners have asked me hundreds of times, “what product is most efficient?” and I always recommend paired-panel folding partitions. Recently, CSI MasterFormat even changed the name of operable partitions listed within Section 10-22-26 to a new section called “Folding Panel Partitions”, 10-22-39. I guess even the expert specifiers have come to realize that folding partitions are the most efficient and effective ways to divide a room wall-to-wall. I’m certainly not suggesting that omni (single panel) directional or electric folding aren’t also very good, but for the most efficient “bang for your space division buck,” paired panel folding partitions are my recommended choice. The above photo demonstrates a paired-panel folding partition. Folding partitions are designed to divide rooms efficiently by hinging two single operable partition panels together to work as a pair. Each partition has a carrier at the top of each panel that glides smoothly along a straight piece of overhead track. Because the panels are hinged together, the pairs can be set up very quickly to fill the opening. The video below demonstrates the operation of Hufcor paired panels. A quick-set seal system activates both panels at the same time. Then, the final lever closure system is extended to apply force across the opening to seal the vertical joints to reduce any sound leaks around the panels. 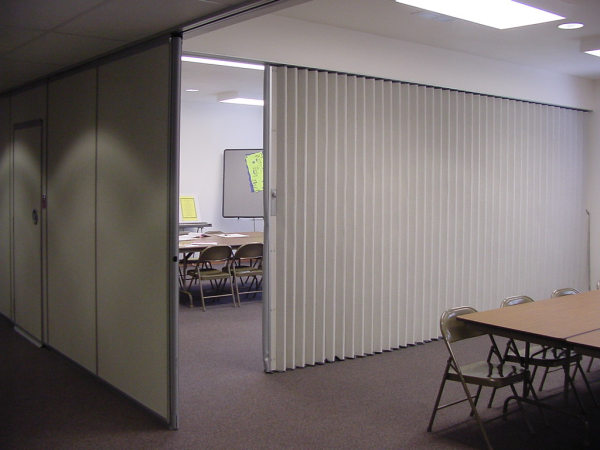 Folding paired panel partitions can be provided in many different types of movable wall systems. Acoustically rated operable partitions used in offices, schools, hotels, convention centers, religious facilities are most common and installed within almost anywhere someone needs to divide a space quickly. Because folding partitions are both easy to install and use, they are designed into nearly every type of commercial building project. 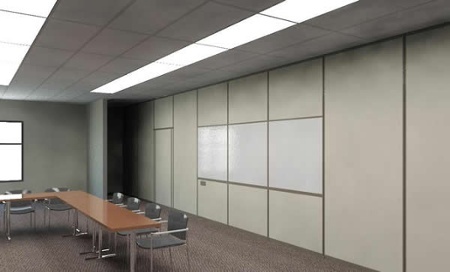 Paired panel partitions have tested acoustical ratings ranging from 43 dB – 55 dB, thus provide a versatile choice for architects and acousticians requiring different acoustical performance. 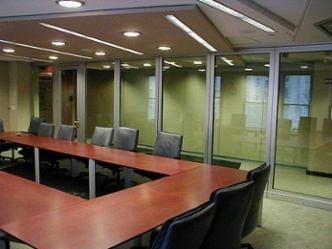 Frameless Movable Glass Walls also are provided as folding partitions. 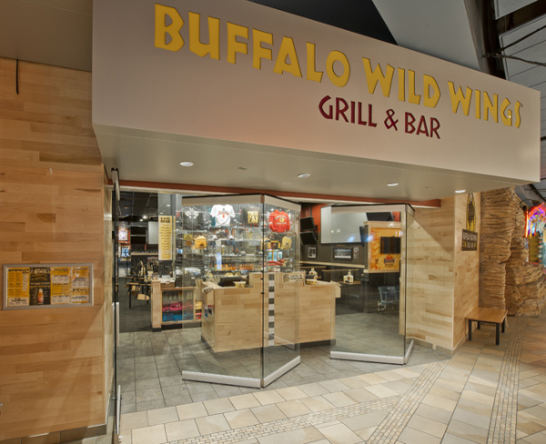 Paired panel movable glass walls are easy to move and operate especially for retail openings as shown in the photo for Buffalo Wild Wings. Acoustically rated glass walls work extremely well as paired panel systems. Again, acoustical movable glass wall systems provide an acoustic separation yet allow natural light to enter into the rooms. To read more about acoustical glass wall systems, click my recent blog post “benefits of acoustical glass walls”. Here’s a unique design using Hufcor acoustical folding glass walls that divide a long narrow foyer into small offices. The new Hufcor lever closure panel is shown here, a special feature exclusively from Hufcor. 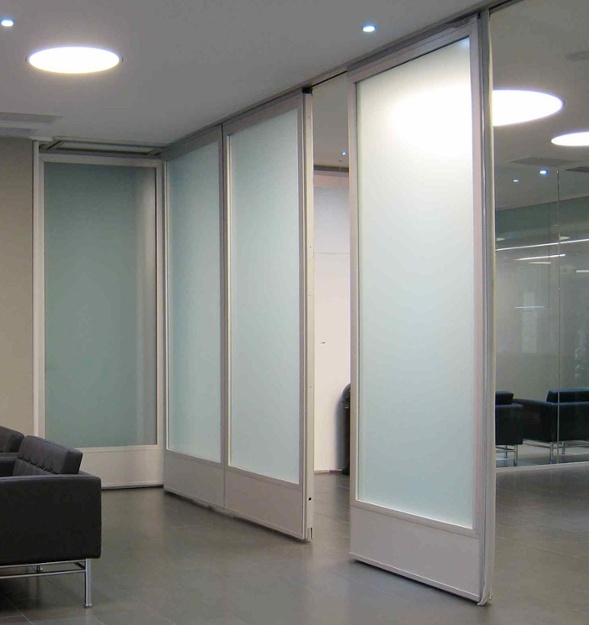 Timber framed glass wall panel systems are also configured in paired panel folding partitions. The richness of wood framed glass walls and the convenience of paired panels is evident in the photo below. Folding partitions are also very easy to stack either at one or both ends of the overhead track. The ease of stacking is another reason architects and owners often choose paired panels. You can see how easy the stack is of the above timber-framed glass partition installed at a Hampton Inn separating the breakfast serving area from the main lobby. Cost efficiency, convenience and flexibility. Three key reasons I continue to recommend the use of paired panels. For more information on folding partitions, visit www.hufcor.com or contact a Hufcor authorized representative in your territory, today! ACOUSTIC GLASS FOLDING DOORS. CLEAR SEPARATION FOR OFFICE SPACES. Office environments are in need of folding doors to provide flexible use of spaces. Yet, traditional folding doors are designed to stop both sound and light from entering rooms. By using newly improved acoustically rated glass folding doors, schools and offices create interior spaces that have the flexibility they need and allow natural light to enter deep into office environments. Certainly all the research supports that humans learn more effectively in schools and office settings, are more productive and healthier within interior environments with natural lighting. A great review of the facts can be found within the National Renewable Energy Laboratory report by L. Edwards and P. Torcelli titled, “A Literature Review of the Effects of Natural Light on Building Occupants.” A quick scan of this report will clearly outline the benefits of daylighting on occupants within offices, schools, retailing, health care facilities and industrial buildings. 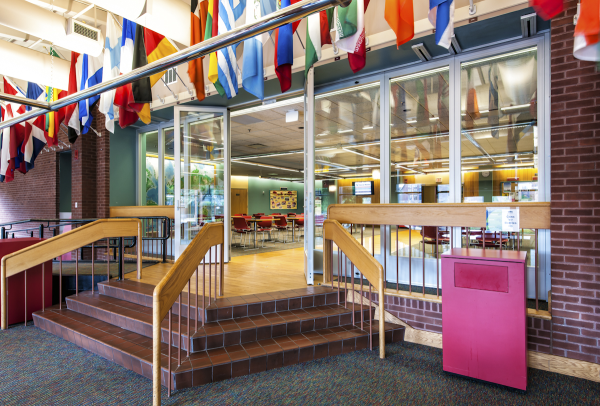 In all of these cases, Hufcor’s acoustical glass partitions offer advantages for maintaining flexibility and allowing light to enter into meeting spaces and deeper into the building. LEED® certified buildings need to achieve high levels of direct daylighting often more than 75% of direct access to natural light within the inner spaces within the building. LEED IEQ 8.1 outline these requirements. 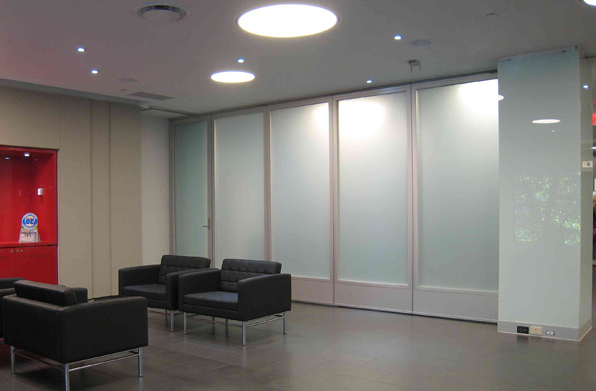 Acoustical glass partitions from Hufcor can assist in achieving these requirements. 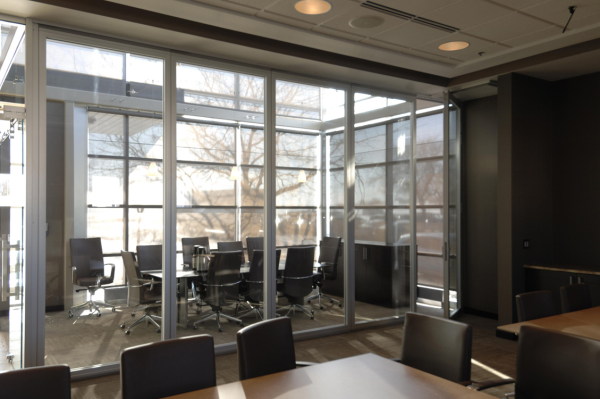 Shown above, the glass folding doors create a small meeting room and allow natural light to enter the larger meeting space in the foreground. Both spaces have direct access to the exterior natural light, creating more productive work spaces. 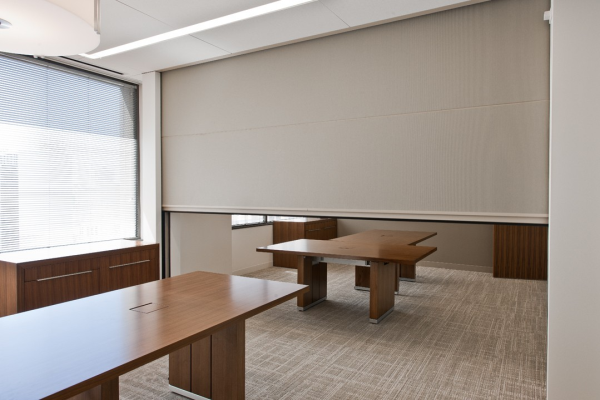 For installations like this one, Hufcor has a magnetically operated inside-the-glass mini blind system to actually block some of the direct sunlight during times when the glare is interfering with a meeting or visual privacy is needed. The above photo demonstrates a newly installed Hufcor acoustically-rated movable glass wall at a school. 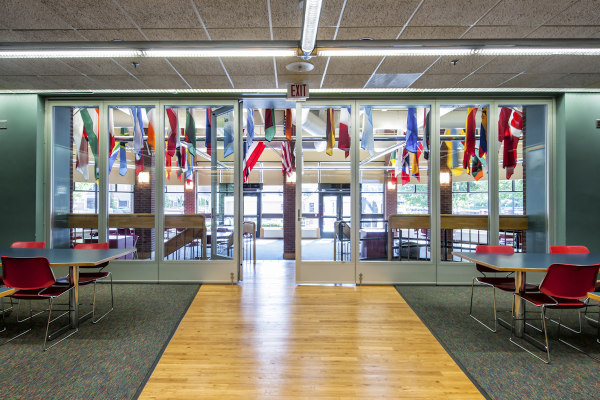 The glass folding door divides a group study hall from a main entrance corridor of the school. 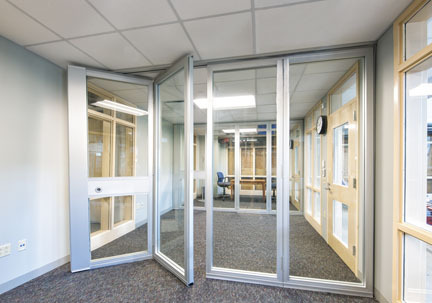 The Hufcor acoustic glass wall system is designed to provide an acoustic barrier between the corridor space that is often quite loud and the quiet study hall area. The panels are installed with dual glazed glass with a minimal 3/8” glass thickness in each glass lite. This combination of glass layers provide a 44 STC between the two spaces. To learn more about daylighting benefits in schools and office productivity written by MIT professor, Marilyne Andersen, link to “Studies on Daylight” to review technologies working to improve accessing natural light. In addition to daylighting and acoustical advantages of glass folding doors, one welcomed feature is the aesthetic nature of glass. Custom patterns, etching, decals and even writing surfaces are all being used with acoustical glass wall systems to provide stunning interior designs. By using etched or frosted translucent glass lites, the panels continue to provide natural light to enter the room, but also provide a level of privacy. Another benefit of clear glass operable partitions is that you can actually see the interior designs of adjacent rooms as well. Businesses spend great amounts on furnishings and decorative wall accents to create inviting environments then, all too often, close the designs off using traditional operable partitions and folding doors. Acoustical glass walls allow these interiors to continue to provide the aesthetic surroundings intended by a designer and the functionality needed with an operable partition. 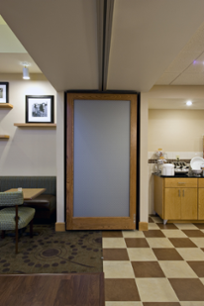 For more information about acoustically-rated glass folding doors, visit www.hufcor.com or contact an authorized Hufcor representative. FOLDING PARTITIONS. THE BASICS FROM HUFCOR, THE GLOBAL LEADER. Hufcor® is the world’s leading brand of folding partitions and folding walls all designed to quickly and efficiently divide commercial spaces. Hufcor operable partitions are designed to fold away and store in parking bays when not in use. The folding partitions are suspended from a variety of different overhead tracking systems and, once in place, have mechanical top and bottom pressure seals that extend to stabilize the panels and stop sound from travel around the folding partition wall. 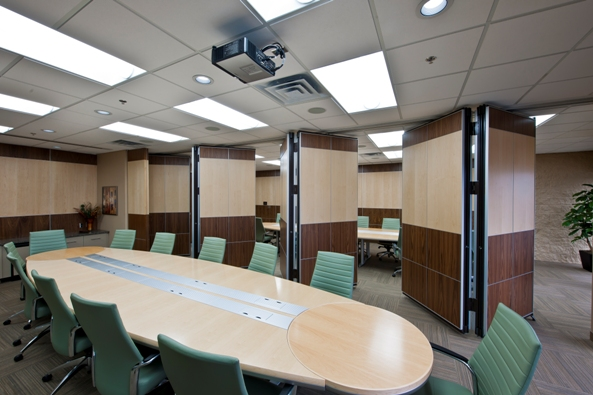 Paired or Omni Directional Wall Panels: These are wall panel systems designed to create flat walls when set up. The wall can consist of single panels or paired (groups of two or three as shown above). These are the most common type of folding walls sold throughout the world in hotels, convention centers, schools, religious facilities, hospitals and commercial office spaces. The panels are equipped with Hufcor’s unique top and bottom “Quik-Set” seals that extend and retract to seal the panels into place and stop sound from leaking around the panels. Manual or Electric Train Panels: Some openings can be filled with a series of folding wall panels that are all continuously hinged together so when extended the panels create a wall. These can either be set up manually or electrically operated. Manual trains can often become too heavy to operate efficiently when designed into larger openings, since the operator must pull all of the weight of the panels across a room at the same time. As such, the better option is to provide electric trains that will automatically extend and retract the folding walls at the push of a button. 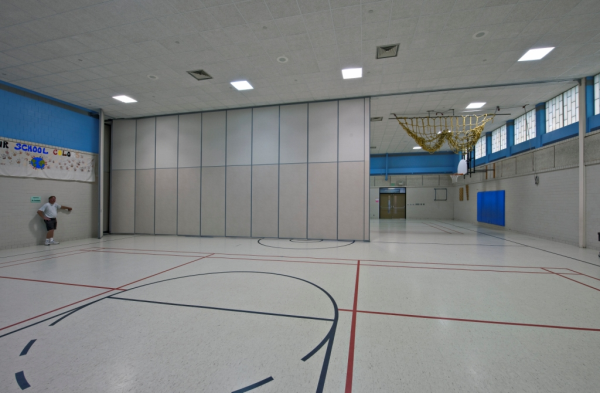 The gymnasium shown above is an example of an electric folding wall. The walls incorporate different safety devices to ensure safe, attended operation during movement of the electric partition. Accordion Doors or Concertina Doors: These folding walls are inexpensive moveable walls that can quickly and efficiently separate a room. However, the wall does not fold flat when the accordion door is extended, hence the name “accordion”. These folding walls cannot achieve the same acoustical performance as flat wall operable partitions, but are less expensive and effective at quickly dividing a room. Retractable Partition Walls: These systems are similar to both single panel partitions, but automatically stack vertically above the ceiling. A simple push of a button and these wall systems retract up into the ceiling without the need for either ceiling or floor storage pockets. The video below demonstrates how the single panel vertically stacking partitions operate differently that the accordion style vertical folding systems. For more information about Hufcor’s complete line of folding partitions and folding doors, click “Representatives” or visit www.hufcor.com.